Pickled salads are nothing but salads marinated with some spiced vinegar for a while. Any crisp fruits and vegetables can be pickled with a spiced vinegar and stored for a couple of days till the salad remains crisp or can be kept longer if the salad is intended to get softer. Cucumber or cabbage pickled salad would taste great even if the vegetables become softer after a prolonged pickling. In this pickled salad I used small apples from the hills that were slightly tart. Small pears and hard sweet and tart peaches also taste great in this salad so please go ahead and pickle some salad and see if you like it. 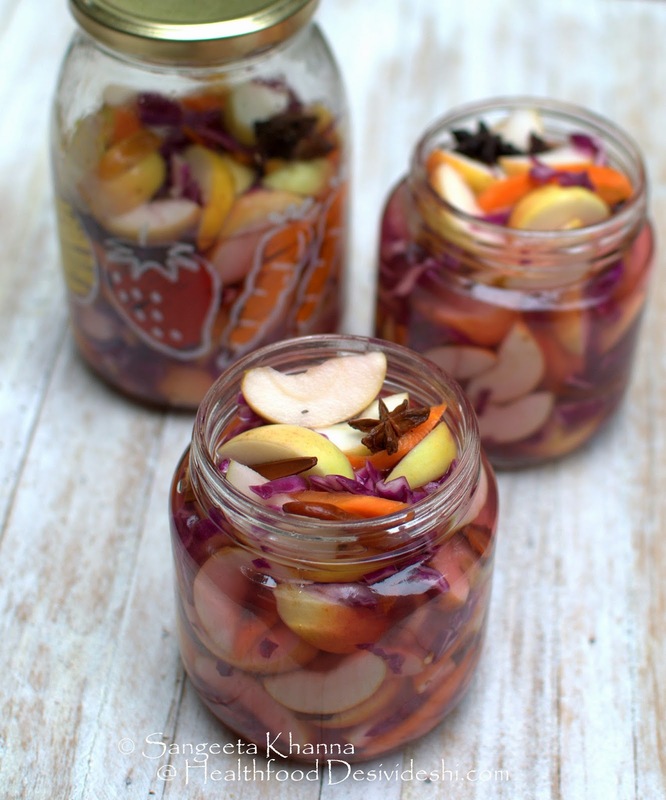 Always use naturally fermented vinegar for the probiotic benefit. I will keep updating this post with more pictures as I have already made a few versions of it, more pictures are there in my home computer and I am writing this post from Te Aroha where this salad has been included in the menu too, using tart apples from their own orchard. Boil the water with the spices, sugar and salt for 5 minutes. Cool and add vinegar to it. Sterilise a few jars and fill the copped apples, carrots and shredded red cabbage in them. Pour the spiced vinegar in the jars and let the salad rest for at least 2 ours before serving. The leftover liquid from the salad can be used to pickle baby onions once or can be had in shot glasses as a probiotic supplement. You can cook the spices in just 100 ml of water and reduce the water further before cooling it down and adding vinegar to it. This will make just enough 'dressing' for the salad to soak in well and there wont be much leftover liquid once the pickled salad is consumed. This method works well if you want this salad made regularly at home. Use this fermented/pickled salad along with chicken or boiled eggs or sausages or cheese etc to make salads or just serve this tart pickled salad on the side with burgers, sandwiches etc. 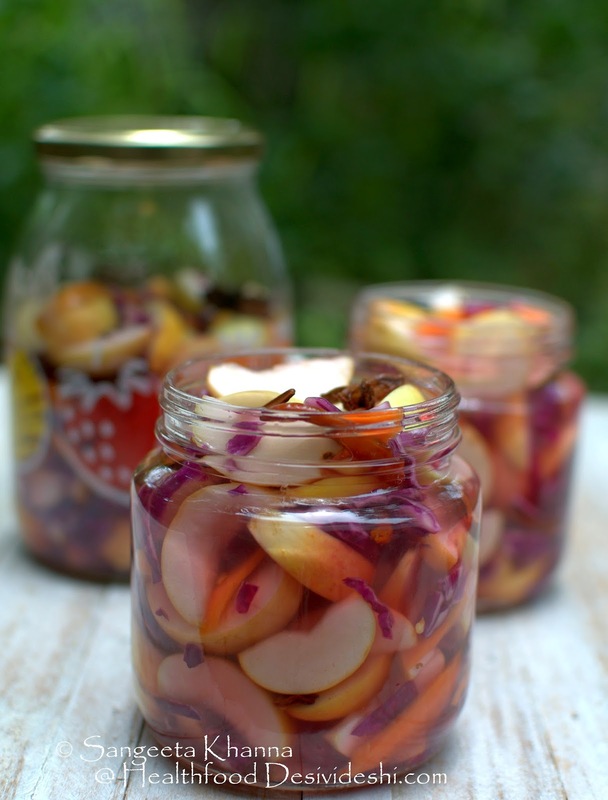 A tbsp of this pickled apple and red cabbage will be really good in your daily smoothie as well.